I have a new banner for my ETSY shop! Some months ago I have decided to change my banner with more attractive. With The Pantone color of the year 2013 - EMERALD and red and white letters. I was wandered what would be the most descriptive thing for my shop where I put mostly patterns. And there it is - lines that is used for patterns in magazines' appendix. A fiend of mine - very talented Maria from Delinda Graphic studio made this banner for me. She is very interesting and creates much more. Visit her shop to pick up something to change your decor. Sonya from Artisania. She was notified by Jen who blogs at Sewhooked about the theft patterns. I have copied this text from Jen and put here. "Los Angeles Needleworks is selling PATTERNS AVAILABLE FOR FREE taken from all over the internet, including those from Fandom In Stitches and more. Please, PLEASE support your indie designers and free patterns online and DO NOT purchase anything from them. We would very much appreciate it you could spread the word and help stop this theft." The patterns' designers have to support each other! You like very much free motion quilting, but are not sure you could make it. Quilting on scraps sandwiches look not attractive idea. Then try to make mug rugs with different motifs and shapes. Yesterday was 14 of February so I made it as a gift for a friend with Golden Heart (used golden thread when quilting heart). Cut a piece of fabric 10" x 6" or get something nearly this size. Lay the back fabric 11” x 7” right side down, bating 11” x 7”and this piece. Sandwich three layers with basting stitches. Later you can use safety pin for basting but now you would feel more comfortable with thread basting. 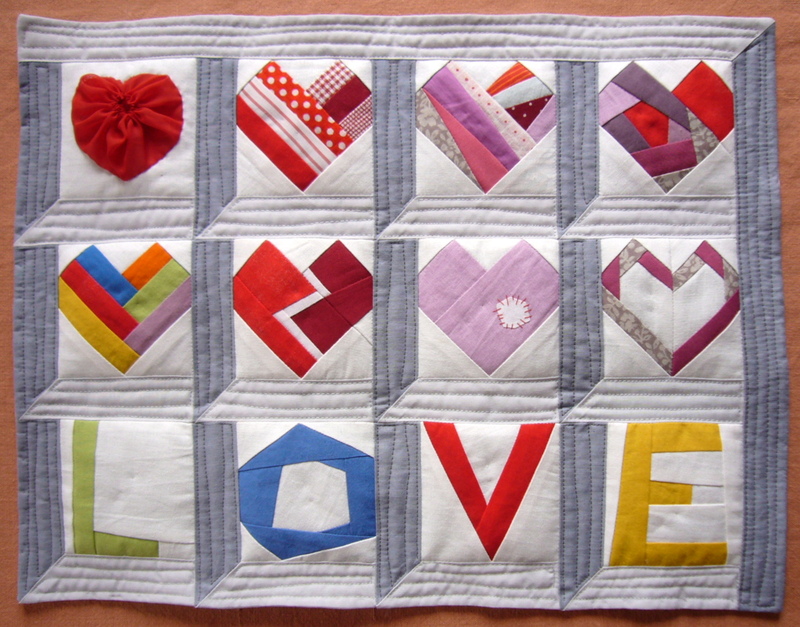 Use running stitch to make a heart on the right side - the shape is free. This will help you when reach the area with FMQ. Put the darning foot and quilting needle (optional). Drop the feed dogs. Thread the needle a black thread. On a piece of paper try to draw shapes - triangles and quadrangles. This will help you later when began drawing by machine. Begin stitching from the left side - I began at down corner. Cover all the surface. Don't worry about the shapes. Keep in mind to make straight lines. A the end you will have something like a web. With a color thread (mine is orange) began stitching parallel lines. Choose another shape not so close to this to repeat. To avoid permanent changing of bobbins and upper thread I filled 3 or 4 shapes this way. Thread another color and do FMQ. Notice that each time I fill different direction - parallel to the black sides. Make this exercise till you fill most of the shapes. I leave some of them blank. I decided to finish with a thread for knitting. I have red about this method but haven't remember where. Draw a line for the place of the thread. Set your machine to zig-zag stitch. Change the foot. Place the thread under the foot and began stitching following the drawn line. Stop when reach the corner in needle down position, pivot , turn the threat without cut and follow stitching. When come to the beginning cut the edges and finish zig-zag. Carefully trim the excess fabrics and batting with scissors. Repeat zig zag stitching along the edge once again. Look at the back. I have the same picture. If you want to have an embroidered logo at the corner as I did you have to do this a the very beginning - before sandwich the mug rug. OMG! I have found the site I have red about the Edge finish tutorial. What a day was yesterday! Amazing! Two day before I was at Craftsy blog for Valentine day. 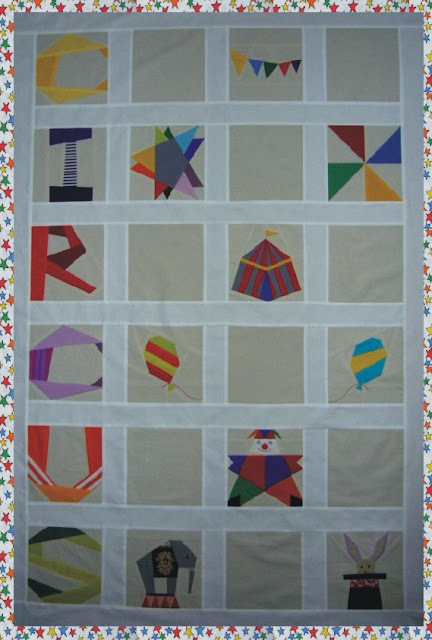 I have finished the Circus time pattern. After finishing the circus elephant it took me some day to collect all the blocks with sashing strips. Now I have to quilt and binding this project. It wold be pleasant time after all my doubts about position of the blocks and choosing the fabric for sashing are in the past. I have some ideas for the blank squares, but come in a few days to see the result of my efforts. Till then check in my Craftsy shop for the pack of blocks. Last morning when I have preparing a whole-wheat bread with different seeds I have seen the following picture in the pan. It looked like a hippie sign. The hippie subculture was originally a youth movement that arose in the United States during the mid-1960s and spread to other countries around the world. The etymology of the term 'hippie' is from hipster, and was initially used to describe beatniks who had moved into San Francisco's Haight-Ashbury district. The ultimate derivation of the terms hip and hep is uncertain, but both were clearly inherited from African American culture and denote "awareness"
Flower children were also associated with the flower power political movement, which originated in ideas written by Allen Ginsberg in 1965. All this inspired me to make a Hippie mug rug. 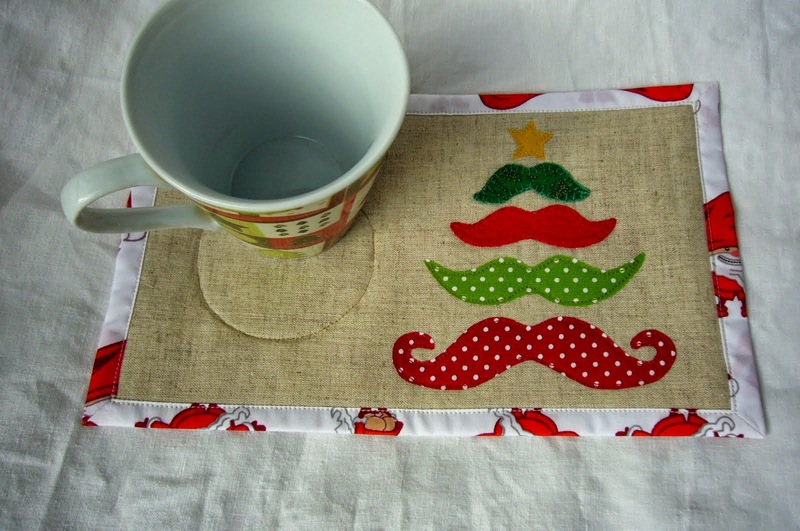 If a man want to have a mug rug I think he hardly likes sweet embroidered mug rugs that is usually made. I decided to make from recycled denim. The back have to be very colorful and except the sign I put a heart and flowers. All the appliqued shapes are rough edges. The mug rug is frayed, too. Get the pattern from HERE or the finished product from HERE. I know you have been waiting so-o-o long. I have began last summer. But some circumstances has happened and I am not in condition to finish circus themed baby quilt. Clown, balloons, rabbit in a cylinder, chapito - circus tent, banners, double wonky star. All of them is available in my CRAFTSY shop. Now the last of the blocks is finished. I am very proud with the elephant dress. This is a vintage fabric that has strips with prints. I think the are the best choice for the dress. I need a little time to finish the top and quilt the whole project. Then I have to describe the pattern and finally till end of the month you will enjoy it. One day I am wandering if any quilting technique can be used in making mug rugs. Decide to try this one and liked the result. I have added detailed instructions and tips in the pattern. You can found it HERE. There is a diagram showing how to zig zag without interrupt the stitching line. I used solids which looks like a painting palette. You can purchase from my SHOP. I continue playing with mug rugs. 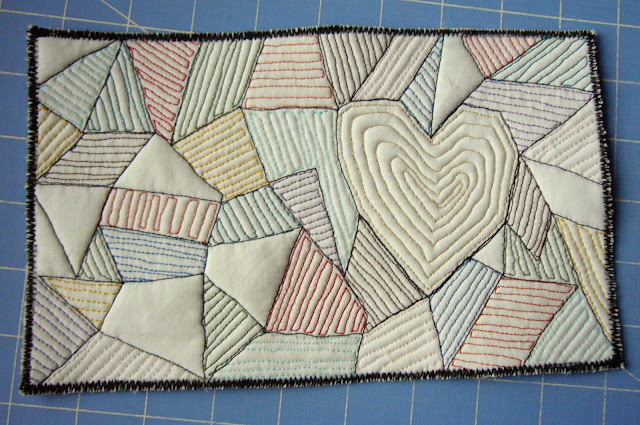 What would be happen if I make a mug rug as rag quilt? Cut 8 squares 4,5 inches from recycled jeans and 8 squares 4,5 inches from different scraps that could be fray easy. 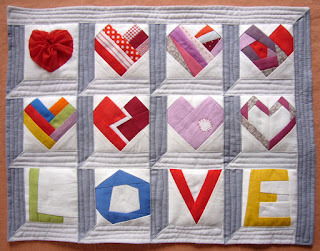 Place each color square on the denim one and chain stitching from corner to corner. Then sew them together 4 columns by 2 rows with 3/4 inches seam allowances. Stitch around the perimeter 3/4 inches from the edges. spacing them about 1/4-inch apart. Clip the corner as shown - I discover this gives great look after fraying. Brush well and wash with cold water. I was unpatient so do this by hand. I like the final look. I have put a yellow thread in my bobbin so the back is charming, too. Can't wait drinking coffee or tea. Anyway I like the look of rag denim, so next time I made the mug rug from two squares only. 6 Inches with 1/2 inches seam allowances will be enough. I would have a half mug rug for my mug and a half mug rug for my cookie. What a funny Sunday I have!